The brand new EOS RP is Canon's second ever 35mm full-frame mirrorless camera. 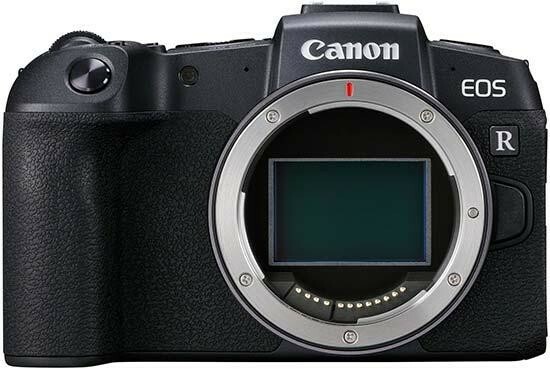 The Canon EOS RP has a 26.2 megapixel CMOS sensor, DIGIC 8 image processor, 4K UHD 25/24p video recording in 8-bit 4:2:2, a touch-screen interface, 4,779-point Dual Pixel CMOS AF System that can focus as low as -5EV, ISO 50-102400, a 3-inch 1.04 million dot vari-angle LCD monitor, a 2.36 million dot electronic viewfinder, integrated Wi-Fi / Bluetooth connectivity, 4fps burst shooting with AF tracking (5fps without), CR3 14-bit RAW support, USB in-camera charging and a flash hot-shoe. The EOS RP is Canon's second 35mm full-frame mirrorless camera, following hot on the heels of the EOS R model that was released in September 2018. Instead of being a higher-end, pro model, as had widely been predicted by the photography press and hoped for by many enthusiasts, the EOS RP is a much cheaper camera than the R - indeed, it's currently the cheapest full-frame mirrorless camera on the market, and by a large margin, significantly undercutting the likes of the Nikon Z6, Panasonic Lumix S1 and the Sony A7 III cameras. Indeed, priced at £1,399.99 / €1,629.99 / $1,299 body-only, the EOS RP actually steps on the toes of smaller format cameras like the Fujifilm X-H1 and X-T3, Panasonic Lumix G9 and Olympus OM-D E-M1 II, which shows just how aggressive Canon have decided to be in terms of pricing and widening the full-frame market. The "P" in "EOS RP" actually stands for “popular” in Japanese, signalling Canon's intent to release a camera that will appeal to as wide an audience as possible. The sub £$2000 full-frame mirrorless barrier has been well and truly smashed with the launch of the Canon EOS RP, and it'll be very interesting to see how Canon's rivals respond in the coming months (Nikon have already signalled their intent to launch a similarly priced rival camera to the RP). The Canon EOS RP continues to use the new RF lens mount, which made its debut on last year's EOS R camera, so this new model can utilise the four lenses that were announced alongside the EOS R - the RF 24-105mm F4 L IS USM kit lens that we predominantly reviewed the camera with, the RF 50mm f/1.2L USM, the RF 28-70mm f/2L USM and the RF 35mm f/1.8 MACRO IS STM. At the time of writing, these are the only RF lenses available to buy, although Canon have released a lens roadmap with lots more RF lenses on it. With the exception of the RF 35mm f/1.8 MACRO IS STM, all of the RF lenses released so far are actually more expensive than the EOS RP body, which has resulted in Canon creating some rather interesting lens kits for the RP, in that two of them are based upon EF DSLR lenses mounted via the Mount Adapter EF-EOS R. While these lenses work very well on the new EOS R/RP bodies, it does perhaps illustrate the lack of affordable, compact lenses in the fledgling RF lens range, something that Canon haven't really addressed in their RF lens roadmap. At the moment, you can choose to mount big, expensive RF lenses on the EOS RP, or more compact, cheaper EF lenses. This is especially important given just how compact the new Canon EOS RP camera is - at 132.5x85.0 x70.0mm and 440g, it's smaller and lighter by 175g than the EOS R model, and also smaller and lighter than a comparable DSLR like the 6D Mark II. This means that even the standard RF 24-105mm F/4L IS USM kit zoom lens feels front heavy on the EOS RP, especially when it's zoomed to 105mm as the lens barrel extends further. Canon have sought to address this by releasing the Extension Grip EG-E1, a nicely designed handgrip extension for the EOS RP which makes it more suitable for both people with larger hands and for using the camera with larger, heavier lenses. The new EOS RP is the smallest and lightest full-frame camera currently available on the market. Despite the EOS RP's lightweight nature, though, the chassis is actually made of magnesium alloy, and it offers the same level of weatherproofing as the EOS 80D DSLR. As mentioned above, in addition to the four native RF mount lenses, it's also possible to use EF and EF-S (but not EF-M) mount lenses on the Canon EOS RP by fitting one of four new lens adapters. There's the EF-EOS R adapter that's supplied in the box with the EOS RP, plus the EF-EOS R adapter with built-in control ring, EF-EOS R adapter with built-in circular polarizing filter, and finally the EF-EOS R adapter with built-in variable neutral density filter. All four of these adapters work equally well with both the EOS R and RP cameras. In terms of styling, the Canon EOS RP once again looks like a DSLR camera, albeit one with the pentaprism on top chopped off. There's a surprisingly chunky handgrip on the front which is generously sized given the overall dimensions of the camera, with the small but tactile shutter button set into the sloping front of the grip. On the front of the camera, there's a porthole for the AF assist light, a lozenge shaped button for releasing the lens, and the 54mm diameter RF mount. 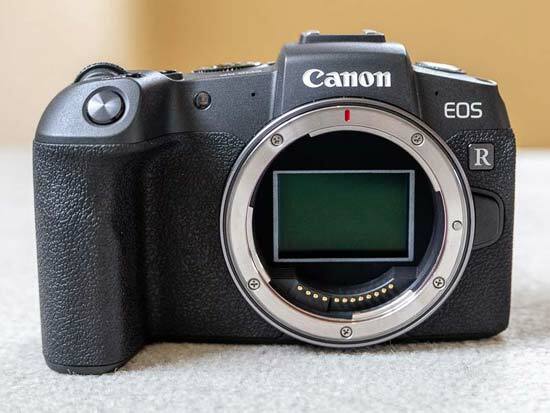 Unlike the more expensive EOS R, though, the sensor is not protected by a physical cover when the camera is turned off, instead being left open to the elements, as with all other full-frame mirrorless cameras currently released. At the heart of the EOS RP lies a 26.2 megapixel CMOS sensor, this time with an optical low-pass filter rather than without as on the ESO RP. 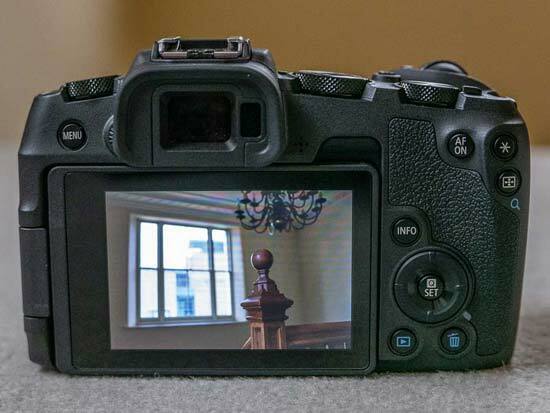 This shares the exact same specification as the sensor inside the EOS 6D Mark II DSLR, although Canon were at pains to point out that the two cameras don't share exactly the same sensor. 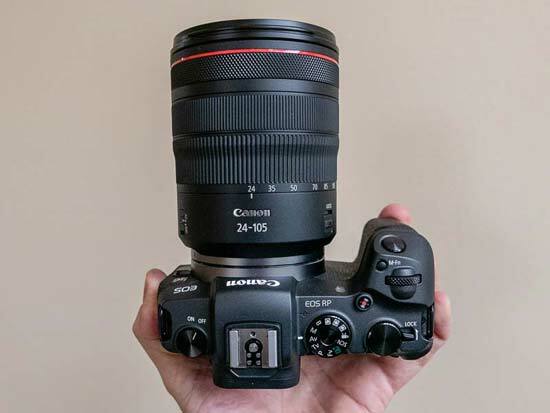 Coupled with the latest Digic 8 processor, the EOS R has an ISO range of 100-40000, extendable to 50-102,400, which again matches the 6D Mark II and also the higher-priced EOS R.
As on the EOS R before it, Canon have once again decided not to implement an in-camera image stabilisation system on the new RP model. For better or for worse, they've decided to omit IBIS and build it into some of their lenses instead (but not all), resolutely sticking to their guns that a lens-based system provides technically better stabilisation whilst making the camera smaller. 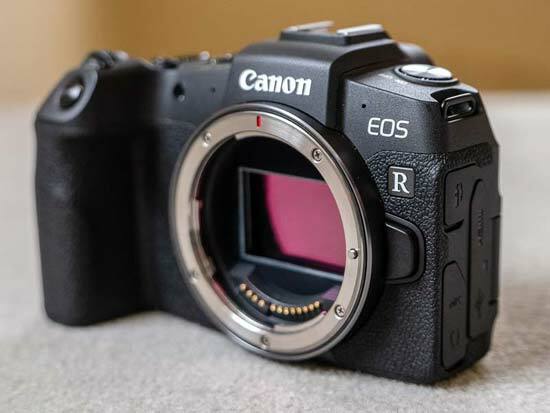 Whilst this was a potential deal-breaker on the more expensive, larger EOS R, especially as all of its main rivals have built-in body image stabilisation, we can forgive Canon a little more on the EOS RP, given that it's smaller in both size and price. There is a new Dual Sensing IS system that reduces camera shake for handheld photography, and also the Movie Digital IS mode provides 5-axis movie stabilisation to counteract shake during video recording. All is not quite as rosy as a glance at the spec sheet would indicate, though, as the EOS RP once again automatically applies a massive 1.6x crop on the sensor in 4k mode (just like the EOS R), which effectively changes the focal length of the fitted lens, making wide-angle framing much more difficult. So difficult, in fact, that you'd currently need to use a non-RF lens achieve a natural viewing angle for video. Even worse than on the EOS R, the excellent Dual Pixel CMOS AF system is not available when recording in 4K, with the camera instead relying on contrast-based AF, just like the EOS M50 APS-C camera. You have to drop the video quality down to 1080p to avoid the crop factor and benefit from Dual Pixel CMOS AF, which rather defeats the purpose of buying this camera for recording 4K video. In terms of the video specifications, the Canon EOS RP can only record internally or externally at 4:2:0 8-bit, rather than externally at 4:2:2 10-bit with C-Log as on the EOS R. There are a choice of 25p or 24p frame rates for 4K and up to 60p for Full HD, but there's no 120fps slow-motion option as on the EOS R. All-in-all, video on the EOS R is something of a disappointment, especially in 4K. A lot more understandable on a camera like the EOS RP is Canon's decision to only implement one card slot, and for the standard to be SD UHS-II, rather than anything more technologically advanced like XQD cards. Slightly more annoying is the fact that the card slot is shared with the battery compartment in the base of the camera, which means that you have to take the camera off a tripod in order to access both the card and the battery. Silent shooting has long been a staple feature of mirrorless cameras, but on the EOS RP Canon's engineers have effectively made it an option that's only available to beginners. They've done this by turning it into a dedicated scene mode - set the shooting mode dial to SCN, then select Silent Mode from the options - but doing so hands all creative control over to the camera. 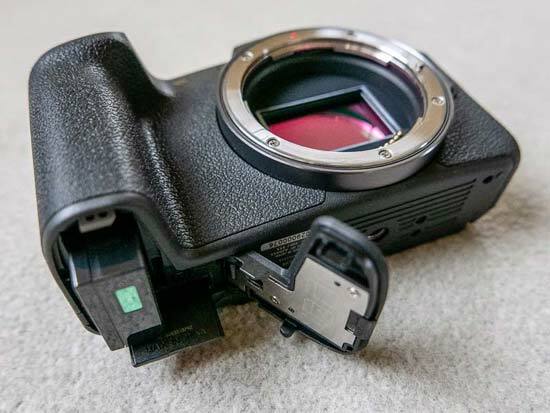 Bizarrely you can't shoot in Aperture or Shutter Priority or Manual modes and also set the camera to silent shooting, something that virtually every other mirrorless camera on the market is capable of. 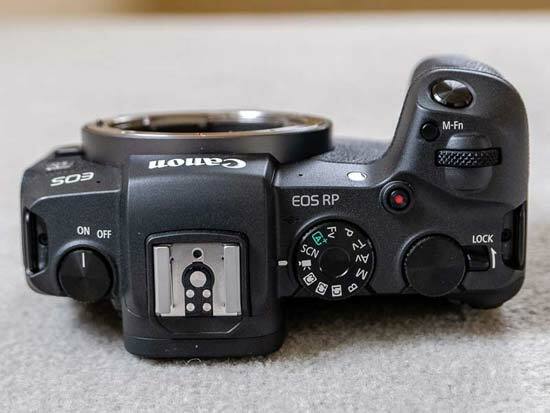 The Canon EOS RP uses the same LP-E17 battery as the EOS 800D DSLR and M50 mirrorless cameras, rather than the larger LP-E6N battery used in the EOS R. This provides a rather mediocre CIPA rated life of 250 shots, although you can at least recharge the camera via its USB 2.0 port as well as using the supplied charger. 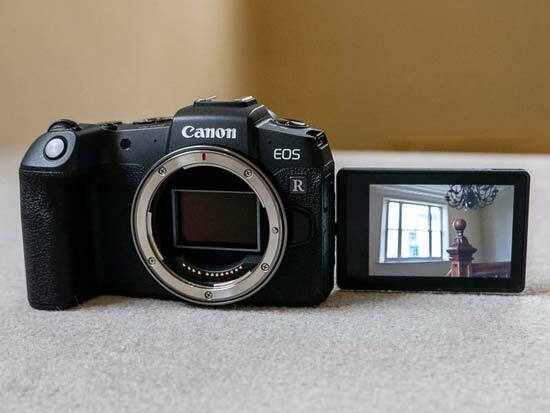 Give the aggressive price-point, we like the EOS R's EVF and LCD screens. The former has a respectably high resolution of 2.36 million dots, 100% scene coverage and a magnification of 0.70x, which almost but not quite matches the EOS R which offers 0.76x magnification. The RP's LCD screen is a 3-inch unit with 1.04 million dots, again lower-specced than the EOS R, but once again vari-angle in nature, which makes it a joy to use for both stills and video. Turning to the top of the camera, the EOS RP loses the handy top-panel LCD found on the EOS R, but gains a proper shooting mode dial, something that was sorely missed on the EOS RP's more expensive sibling. On balance on a camera like this, we'd rather have a dedicated shooting mode dial than an LCD status panel - indeed, we would have opted for the same configuration on the EOS R if given the choice, as it speeds up the operation of the camera, especially if you switch between shooting modes a lot. 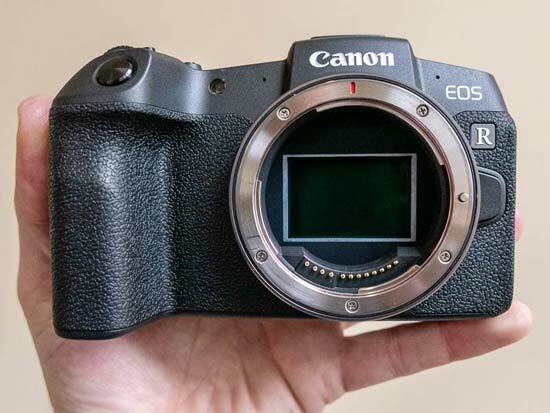 Another welcome omission from the design of the EOS RP is the lack of a M-Fn Bar. On the EOS R, this rather strange touch-sensitive control located underneath your right thumb can be customised to access different key settings, and the way that it works can also be customised too. It's fair to say that the M-Fn Bar takes some getting used to, so much that we were never convinced that it was a particularly good idea on the EOS R, so it's with a sigh of relief that we see that it hasn't also made its way onto the new EOS RP. Unfortunately, Canon haven't actually put anything in place of the M-Fn Bar on the EOS RP - instead there's just a blank area. Consequently there's still no AF joystick and/or an AEL button, one of our main criticisms of the EOS R, which again makes it much harder to set the AF point than on rival cameras. Instead you have to use the 4-way navigation pad or touch and drag the AF point on the rear LCD, both much less satisfying alternatives to a good joystick, which is something that power users will definitely miss on the EOS RP. You can at least use almost the whole screen when touch and dragging the AF point, or you can apportion a section of the screen, for example the bottom right, to allow you to change the AF point. This is particularly handy if you find that your nose or face is accidentally moving the AF point when you don’t want it to whilst using the viewfinder. On a more positive note, the Canon EOS RP has one of the more advanced AF systems on the market. Canon have built on the proven phase-detect Dual Pixel CMOS AF System in their DSLRs to develop a new variant with no less than 4,779-points, almost as many as the 5,655 points on the EOS R. These cover almost the entire frame - 88% vertical and 100% horizontal - making tracking moving subjects easier and more precise, and allowing you to focus on off-centre subjects without having to reframe. The EOS RP's AF system is also capable of reacting in just 0.05 seconds, which Canon claim make it the quickest full-frame mirrorless camera in the world. Finally, the EOS R can also focus in low-light down to a CIPA-rated -5EV (with certain lenses), an incredible achievement that's almost as good as the -6EV rating on the EOS R.
Less impressive, though, is the Eye AF system, which is enabled as part of the Face Detect AF option rather than as a dedicated option. It worked fine reliably outside in bright sunlight, but struggled a lot more in low-light conditions. On a more positive note, you can now enable it in AF-C mode, as well as AF-S, something that we'd hope to see implemented soon on the EOS R via a firmware update. There's also a new Single-Point Spot AF mode, again not found on the more expensive EOS R.
When it comes to capturing fast moving subjects, the Canon EOS RP lags behind its main rivals in terms of all-out shooting speed, and is also slightly slower than the EOS R. The headline figure is 5fps burst shooting, but that's only when setting the focus point at the first frame, useful for golfers but little else - it drops to a pedestrian 4fps with AF tracking. There's a decent buffer of 50 Raw files or unlimited JPEGs, but the camera simply isn't fast enough for sports and action photography. The Canon EOS RP offers both Wi-Fi and Bluetooth connectivity. You can use the latter as a low-power alternative to Wi-Fi to control the camera and for automatically transferring images across to your phone ready for super quick sharing. It’s also easier and quicker to set up and use than connecting to the camera’s Wi-Fi network, which is still a rather long-winded process. The EOS RP also has one unique feature never before seen on any Canon camera - focus bracketing. You can take up to 999 shots in total and then blend them together in Canon's Digital Photo Professional software, although at the time of writing a version of DPP that that could do focus bracketing wasn't available for review. Unfortunately you can't blend the images together in-camera.